Merula is the most unpleasant character you will meet in Hogwarts School of Witchcraft and Wizardry. She will also have a major role in the game, but she will cause you a lot of problems as you glide through your wizarding adventures. You will first meet her on your way to the Potion Classroom, yelling at Rowan Khanna and immediately showing her personality, bold and arrogant. Merula Snyde is a pure-blood that came from a British family of Death Eaters. Death Eaters were wizards who are mainly focused on Dark Arts (spells like curses that cause harm to others) and followed Lord Voldemort's commands. After Lord Voldemort vanished, death eaters were left alone with no one to watch over them. Most of them were caught and sent to Azkaban, including Merula's parents. She was around 8 years old when her parents were sent to Azkaban, the biggest and the cruelest prison for the wizarding world. She was full of despair, growing up without her parents. In order to stay strong, she found comfort in anger. From her perspective, it was everyone's fault her parents ended up as they did. So she ended up hating other wizards, especially Mudbloods. At the Sorting Ceremony, she was sorted into Slytherin being the 4th generation of the cunning and the ambitious. Chapter 2: Her first appearance was with Rowan Khanna, where she first showed her temper by trying to make him admit she is the most powerful witch at Hogwarts. Later, in the potion classroom, she sabotaged your Cure for Boils potion by adding Bulbadox powder and making your cauldron explode, which cost you 10 house points. Chapter 3: Merula made a fake letter posing as Professor Snape, which made your protagonist and Rowan come to the Potion Storeroom where she locked you in with the Devil's Snare. 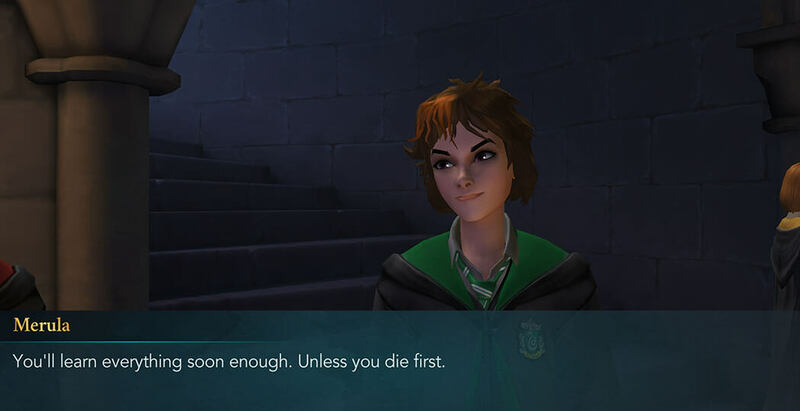 A few days later, she confronted you protagonist and Rowan after the game of Gobstones and started attacking you verbally with insults, claiming your missing brother Jacob was working for Lord Voldemort. She provoked you into a duel but you were too weak to confront her and she made you fall to the ground by casting Flipendo Charm. Chapter 5: Merula made a big commotion in the Courtyard wanting to force Ben Copper to leave Hogwarts, claiming he is a disgrace and that Mudbloods shouldn't be allowed to study wizardry. Your protagonist jumped in the middle of the commotion wanting to help Ben Copper which ended up provoking Merula into a duel. Chapter 6: Mr. Filch and Professor Snape were talking about the Cursed Vaults and she was eavesdropping on them wanting to get some information about the vault, the same exact thing your missing brother Jacob was searching. She ended up being interrupted by your character. 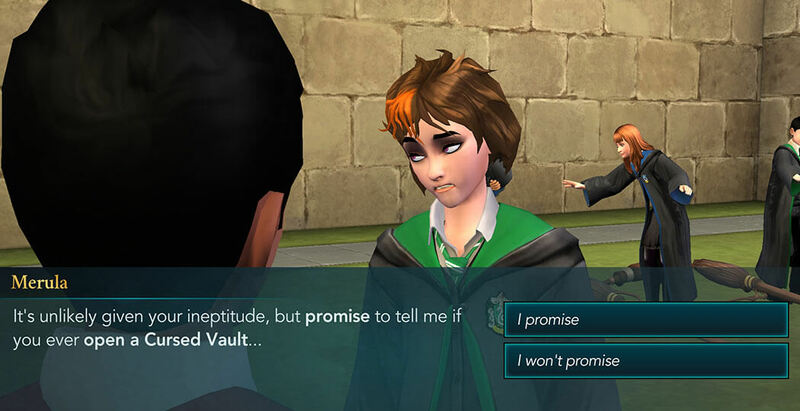 Chapter 7: While your protagonist is in the potion class making the first Herbicide Potion, he notices that Merula isn't doing her potion right and he kindly suggests a solution, which will lead to her thinking that you just want to prove she doesn't know anything and that you are better, instead of you just want to help her out. 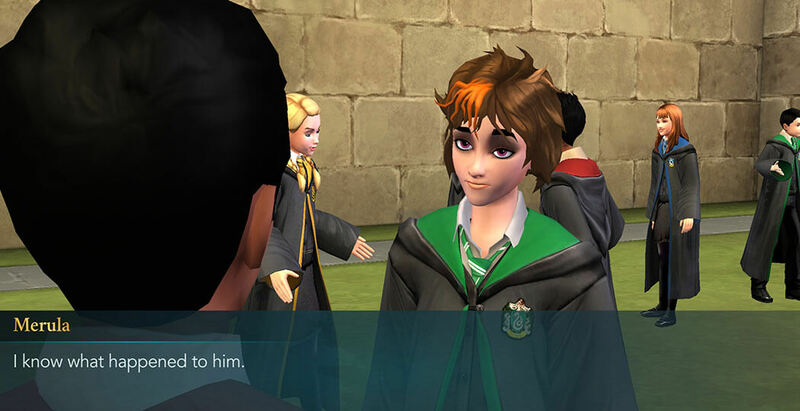 Chapter 9: Merula will prove she means business by using Flipendo on your character, Ben Copper (or Penny Haywood depending on who you picked) and Rowan Khanna. She wanted to enter the secret room before anyone so she can unravel the secret of the Cursed Vaults. Merula will get trapped in the cursed ice and end up being saved by your protagonist and his friends. Merula’s personality hasn’t changed much in the second year. She still seems annoyed at the very sight of you since you jeopardize her self-proclaimed status as the most powerful witch at Hogwarts. Even after losing to you in a duel, she hasn’t calmed down. Chapter 1: You meet Merula in the halls after you’ve finished learning the Engorgio spell in Charms class. Being her usual self, she can’t refrain from insulting your friends, this time Ben in particular. She also mentions something about the secrets of the Cursed Vaults, but doesn’t give away much information. She is very vague, but you can just tell she is up to no good! 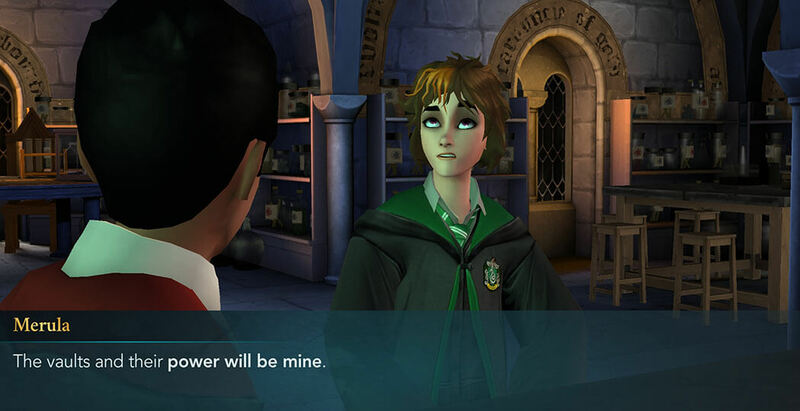 Chapter 4: Merula will also be there in Potions class in Chapter 4. There, she will tell you she not only wants to duel you, but she wants to destroy you! Even your attempt to peacefully resolve things fails. It is clear she is still shaken up by the outcome of the last year’s duel and is hell-bent on revenge. When you meet Merula again in Chapter 4, the two of you will duel. If you’ve been practicing your spells and duel skills, you will be victorious again. 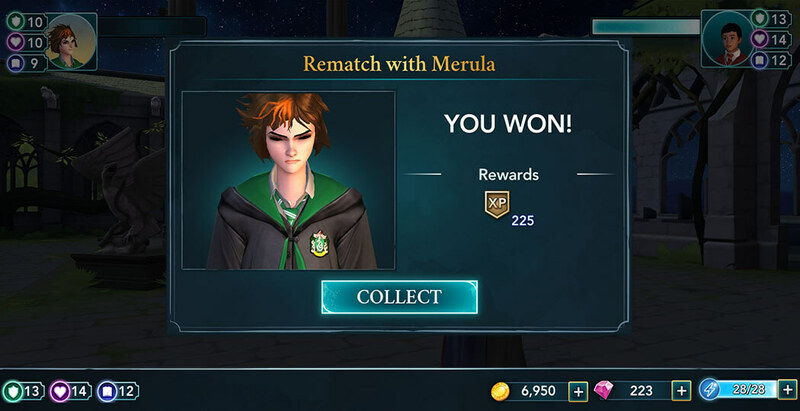 Another defeat ought to put Merula in her place… Or so you would think. 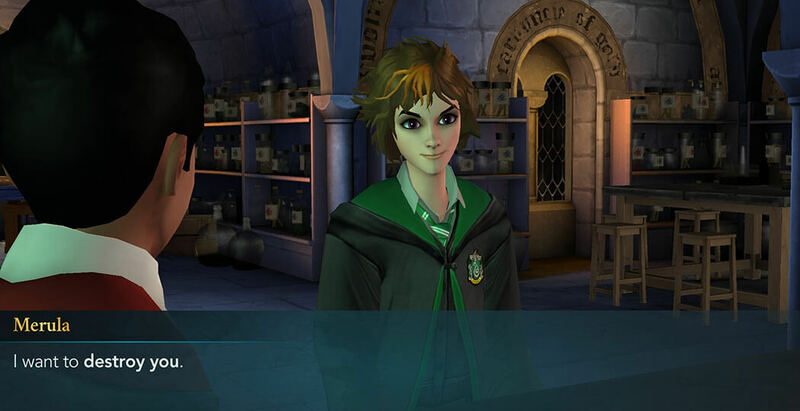 Chapter 5: Hostile as always, Merula approaches you in Potions class in Chapter 5. She tells you that she plans on claiming the power of the Cursed Vaults for herself and that she will do whatever it takes. 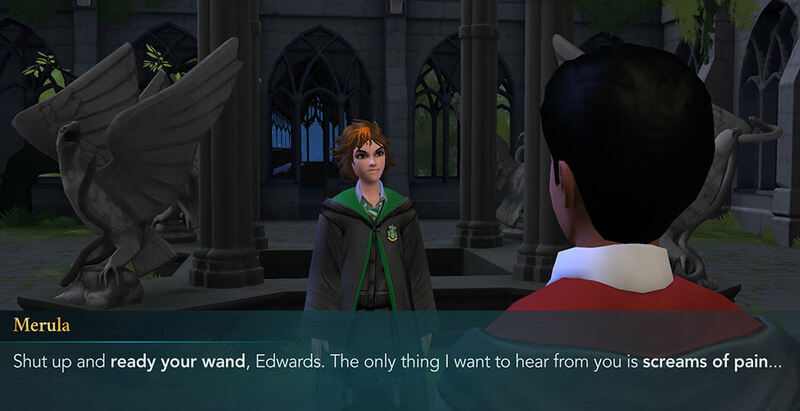 You will have one more encounter with Merula in Chapter 5 and this time she will approach you saying she knows what happened to your brother. Before you can continue the conversation, flying class begins and you are interrupted. Once you get a chance to talk to her, you can resume the dialogue. She will make you promise to share any information you might obtain regarding the Cursed Vaults. Only when you have something useful will she tell you whatever it is she knows about your brother.